Tonbridge Angels FC, are a non league club who come from Tonbridge (pronounced Tunbridge) in Kent, which is located twenty nine miles south east of London. The market town is known for its castle and public school. Tonbridge FC, as the club were originally known, were formed in 1947 on the suggestion of a local businessman Mr Herbert Portch, who became the first Chairman. The club was elected into the Southern League for the 1948-49 season playing at a former home of Kent CCC, The Angel Ground, named after a nearby hotel. Tonbridge collected their nickname of 'The Angels, from this. Tonbridge found progress in the league difficult, but they reached the FA Cup First Round for three successive seasons from 1950-51. They were defeated by Chelmsford City, Aldershot and Norwich City. The middle of those ties attracted a gate of 8,236 to the Angel Ground. They repeated the feat in 1967-68 where Dagenham ended their run. In the 1972-73 season Charlton Athletic visited town at the same stage of the FA Cup as a gate of 7,770 looked on. World Cup winner George Cohen spent some time as team manager soon after this as the team played in the different divisions offered by the Southern League. In 1976 the club suffered from severe financial troubles and were liquidated, but a new club Tonbridge Angels FC were formed and completed the league fixtures on the understanding that they would be automatically relegated at the end of the season. The club faced other battles as the local council as landlords of the Angel Ground wanted to redevelop the site, with its ideal location close to the town centre and railway station. In 1980 Angels moved to a new ground, Longmead Stadium on the edge of town. The site of the old ground was eventually swallowed up by the Angel Shopping Centre. The move to the new stadium didn't improve matters as finances were still poor, leading to poor performances on the pitch. At the end of the 1987-88 season, the team were relegated to the Kent League. They returned after regrouping after a successful 1992-93 campaign. Many managers followed trying to work the oracle without really succeeding. 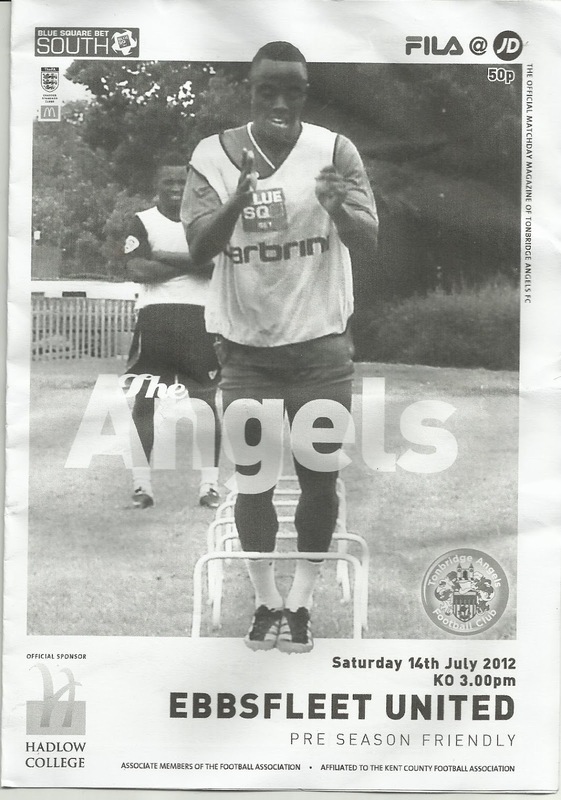 In 2004 non league football was re-organised, with Angels being placed in the Isthmian League. They were initially relegated, but fought straight back to the Premier Division. Towards the end of the 2007-08 season Tommy Warrilow was appointed as team manager and he began a period of marked improvement. Two seasons after a failed play off appearence, Tonbridge went up via the same route after defeating Lowestoft Town in the final to reach the Conference South. Their first ever season at that level, 2011-12, ended with a mid table position. Tonbridge Angels FC will play in the Conference South for the 2013-14 season. My visit to Longmead Stadium was a real bolt out of the blue. I was on night shifts at work and was scheduled to meet my visiting pal from Kolkatta, Sol Chatterjee, for lunch. However, he had to put back our date for a couple of days as he was to meet cricketing legend Sunil Gavaskar. Well I suppose his career record is slightly better then mine! Not to worry I thought, as I knew I'd get to a game instead. However, I didn't know where. As it happened, earlier that afternoon I received a phone call from an old friend from my days in Scarborough from Gary Griffiths. Gary has always loved going to new grounds, partly through his allegience to Cardiff City and Scarborough, but mostly to see as many different places as he could. He was visiting London for a couple of weeks to rack up some matches while staying with another old face Rydell Gray. I got a text from Gary late on the Friday evening, sketching out his planned schedule for football and cricket matches. He was heading to Tonbridge the next day, for what looked like an attractive pre season friendly against Conference side Ebbsfleet United. We made arrangements to meet up for the first time in nearly twenty years the following day. After a sleep after work, I took the tube and then train to Swanley in Kent where my mate was based. I was already in good form after sitting with a Maidstone United fan on the train and sharing some stories of dodgy Chairman and our respective Football League days and the ensuing fight backs. He was really excited as he was on the way to his clubs' first home game in Maidstone for eighteen years. I was due to visit the new ground myself a couple of weeks later, so I could possibly catch up then? Gary picked me up at the station and we had a good chat catching up as he drove us down to the game. We arrived around 1.30pm at Longmead Stadium, his sence of direction as good as ever. We parked up and paid the £8 admission as well as purchasing a light programme for 50p and some raffle tickets. We were both immediately impressed with Longmead Stadium. We were both in agreement that too many of the newer grounds hardly had any club colours or even signage on display and many were identical. Here we had a traditional ground painted in blue. There was a raised covered terrace directly behind each goal, with a full length seated stand on the far side. The side by the entrance was open, save for a small stand for press and dignitaries. It was flat standing, with all the necessary facilities behind. The changing rooms were over in the far corner. We went inside the clubhouse to carry on our chat as the rain teemed down. Unfortunately for me the hand pulled bitter was off, as it was playing up. I had to do with Tetley smooth. This is not a type of ale I sing any praise for, and the one on offer was as poor as I think I'd tried. I nearly left some of my second pint! We went out for kick off, and luckily the rain abated. The pitch was soggy but didn't cut up. There were large puddles to great the teams at the entrance to the pitch. I was happy to hear an old familiar anthem blast out through the PA system before kick off. I wasn't sure of the relevence of the Aussie Rules favourite Up There Cazaly, but it reminded me of many happy days on cricketing tours with my pals from Yarrambat. It is fair to say that Ebbsfleet came flying out of the traps. They took the lead after Moses Ashikodi opening the scoring after only three minutes. Liam Bellamy added a second 10 minutes later and Fleet added a third as Ashikodi added his second. Angels pulled one back before the break through Chris Piper. The home side had plenty of good play going forward, but they were undone at the back by some fast and physical football, with passes into the channels being pulled back for the waiting scorers. We walked back to the clubhouse side at the interval. We stood between the Main Stand and the changing rooms after deciding not to pay the £1 transfer to the seats. Both of us thought that was a little excessive for a friendly. As the queue abated, we tried out the catering. The burgers were of decent quality. Unfortunately while collecting our goods we missed the visitors fourth goal added by Nathan Elder. We stood near the small directors stand by the corner flag as a multitude of substitutes from both sides warmed up in front of us and chatted away between themselves and to fans. Fortunately both the home boss Warrilow and Fleets Liam Daish didn't make too many changes, which helped the games flow. Further goals, similar to the ones in the first period were added by Serge Makofo and then an unfortunate own goal from Ben Judge as he attempted to cut out another dangerous ball across the six yard box. It had been a good game, especially for the neutral. Chances were aplenty at both ends and the game had plenty of good challenges, while played in a competitive but good spirit. We made a quick get away and I made it to the 5.26 train at Swanley back to Victoria, so I could have a few hours shut eye before my next shift at work. It had been great to catch up with an old friend, with more games arranged over the following few weeks, and it was good to visit a traditional football ground and see a very decent match. It was my first game of the 2012-13 season. If only every day out could be like that one!